I love trying and tasting new flavor with potatoes, yes Potatoes are an easy way to increase the nutrients and fiber in your diet. I always like to include potatoes in my week menus.As you all would have known , I love potatoes and paneer in vegetarian dishes.I wanted to mainly see the beauties of baby potatoes and not mash them. So I usually focus more on a recipe where we can see these little potatoes without much chopping and cutting, like my recipes of spicy aloo ,Hara Aloo Thought of ,mentioning my ideas as it may help for people who want to try different recipes from these little potatoes. Boil baby potatoes until done . don’t overcook the potatoes. Peel and halve each potatoes. Grind kokum into a thick paste with red chili powder ,fennel seeds and water. Heat oil in a pan. Add chopped green chillies and curry leaves, and stir for a minute. Mix it with kokum paste. Add red chilli powder if you want to make it more spicy. Add salt and sugar as required and mix boiled potatoes. 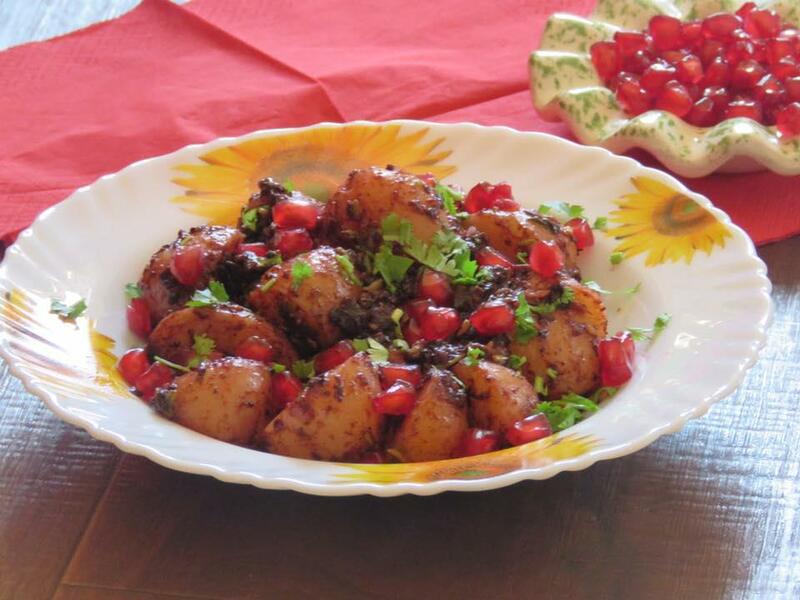 Stir well and sprinkle chopped coriander and garnish it with pomegranate. Potato with KOKUM sounds something really unique. when one of my blogger friend recently requested the recipe I was really curious how would it taste.Kokum is one of the tropical ingredient from India. It can give sour twist to any your daily dish. Kokum Aloo is a dish makes a perfect Delicious appetizer. Here is my recipe for kokum aloo , super appetizing kokum Aloo when served with comfort food like daal and rice, is a Perfect meal!!! Stay Connected with my food updates on Instargam and Facebook @mealswithmemories. Thanks for reading the Post .